Trang chủ / Tin tức / SỰ KIỆN / Extreme Networks Completes Acquisition of the Networking Business from Avaya, Inc.
San Jose, Calif. — July 17, 2017 – Extreme Networks, Inc. (NASDAQ: EXTR) announced today that it has completed its acquisition of Avaya Inc.’s ("Avaya") networking business. The acquisition supports the company’s growth strategy to lead the enterprise networking market with end-to-end software-driven solutions for enterprise customers from the data center to the wireless edge. As part of this transaction, Extreme acquired customers, personnel and technology assets from Avaya. The acquisition strengthens Extreme’s position as a leader across the education, healthcare, and government markets with the addition of Avaya’s award winning fabric technology for highly secure, simplified access, management and control. The acquisition also strengthens Extreme’s switching portfolio, including a new family of high performance modular switches, software tools and IoT technology. Extreme continues to anticipate the transaction will be accretive to cash flow and earnings for its fiscal year 2018, which began on July 1, and expects to generate over $200 million in annualized revenue from the acquired networking assets from Avaya. Except for the historical information contained herein, the statements in this release, including those concerning Extreme's business outlook, future financial and operating results, and overall future prospects are "forward-looking statements" within the meaning of the "safe harbor" provisions of the Private Securities Litigation Reform Act of 1995. These forward-looking statements speak only as of the date of this release. Actual results or events could differ materially from those anticipated in those forward-looking statements as a result of certain factors, including: our ability to successfully integrate the Avaya networking business into the current Extreme business; failure to achieve targeted revenues and forecasted demand from end customers; a highly competitive business environment for network switching equipment; the possibility that we might experience delays in the development or introduction of new technology and products; customer response to our new technology and products; and a dependency on third parties for certain components and for the manufacturing of our products. 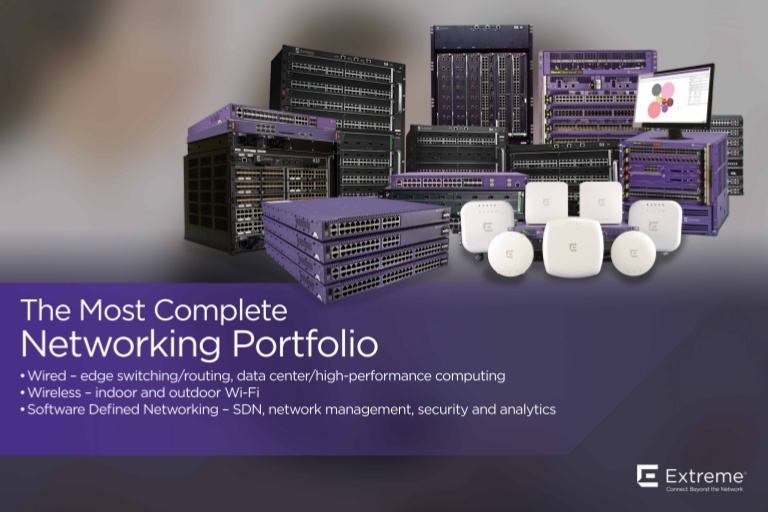 Extreme Networks, Inc. (EXTR) delivers software-driven networking solutions that help IT departments everywhere deliver the ultimate business outcome: stronger connections with customers, partners and employees. Wired to wireless, desktop to data center, on premise or through the cloud, we go to extreme measures for our customers in more than 80 countries, delivering 100% insourced call-in technical support to organizations large and small, including some of the world's leading names in business, hospitality, retail, transportation and logistics, education, government, healthcare and manufacturing. Founded in 1996, Extreme is headquartered in San Jose, California . For more information, visit Extreme's website or call 1-888-257-3000.